Greening Greater Racine: BUILDING BRIDGES. WORKING TOGETHER. MAKING A DIFFERENCE. Join the ZERO WASTE team! 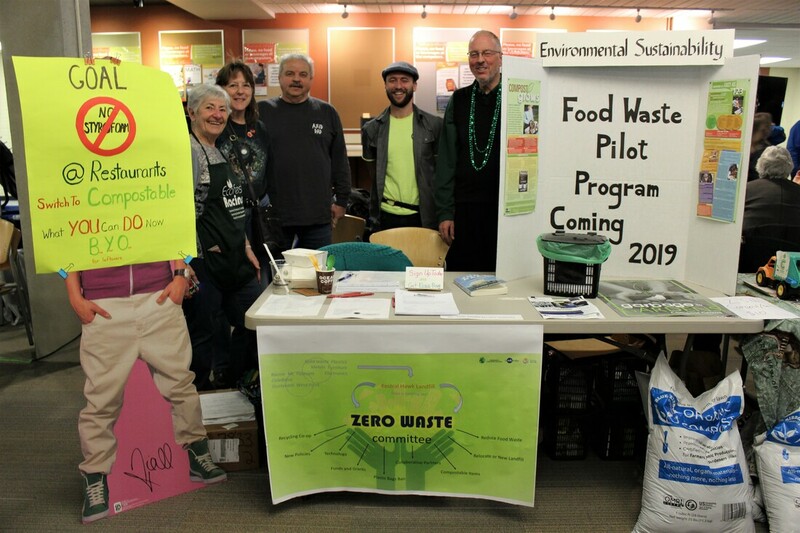 ​The Zero Waste Committee of Greater Racine has been active for over a year working to bring collective action on this movement that is popular in many American cities. The Zero Waste committee is a clearing house for what is happening around the issues of recycling and waste in greater Racine. We support these current initiatives and provide networking opportunities for those working on them. And we brainstorm in seeking to initiate new efforts. We encourage community members to join us with their ideas and actions. The Zero Waste committee is facilitated by Greening Greater Racine and the Eco-WAVE Team of Visioning a Greater Racine. Visit a meeting or ask us any questions you may have at greeninggreaterracine@gmail.com. Stay tuned for updates on the 2019 AmeriCorps NCCC crew! Last year, Greening Greater Racine is proud to have endorsed nine AmeriCorps NCCC North Central Region Class XXIV Oak 4 Team corps members from all over the US to come work on some cool projects throughout the City of Racine. Throughout the two months they are here, they will be tackling various sites possibly planting trees with City of Racine Forestry Dept, working at various City or County Parks with Root-Pike Watershed Initiative Network, at North Beach Park Racine or Sam Myers Park with the City of Racine Public Health Department, around Uptown assisting Racine Revitalization Partnership with home assessments or Habitat for Humanity ReStore Racine, and assisting with home weatherization all around the city. We are incredibly proud and thankful for their work. A special THANK YOU shout out to Pastor Thompkins of Fellowship Christian Believers for providing them a place to stay and Racine Family YMCA for providing them passes so they can have a place for recreation and to do their PT! The following are upcoming events in the Greater Racine area relating to environmental justice and healthy lives. ​If the calendar does not show, try opening this site in Google Chrome or Firefox. Please contact us if you have trouble either way. Learn ways to connect yourself with nature and the community. Every year Greening Greater Racine creates an event to celebrate the efforts of all that promote sustainability. Check out past and upcoming events by clicking HERE. Thanks to a number of people's contributions, we've got a wide variety of "green" RESOURCES for you to check out. If you'd like to share something, send us an email! If you would like to join any of our green initiatives, provide useful resources, submit an event, have questions or comments, helpful advice, add events to our community calendar, advertise something on our Facebook page ...anything! Please feel free to send us an email. Greening Greater Racine is an inclusive environmental movement of people, organizations, businesses, and government leaders working to inspire, educate, and motivate people to take action to make a healthier and sustainable Greater Racine area now and in the future. Check out GGR's news archive! Click HERE! Racine County Eye has been a wonderful advocate to the community of Racine and Greening Greater Racine. Please consider them as your local news and advertising resource. Go local with a print company. They also offer great creativity services. ​Stop by and connect with Econoprint! They helped create a cool icon to be printed for our events. We support as many local organizations as possible. Belle City offers free magazines at various locations. Read about happenings and leaders in the community.